General Admission Tickets w/ receipt sub. Each ticket is 2"x 4" including stub receipt. 500, 2 part tickets per roll. Sequentially Numbered. Great for Admission to school events, functions and fundraisers of all types! Available in 5 brilliant colors. 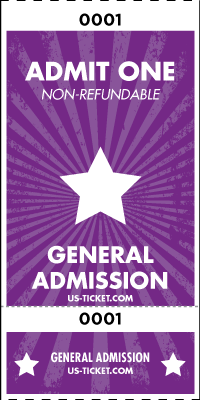 Call us today to design a customized version of the ticket above with your logo/ images and information!